* Mariell's handmade designer Bridal Cap is inspired by Shakespearean Juliet cap & by Grace Kelly's wedding cap. 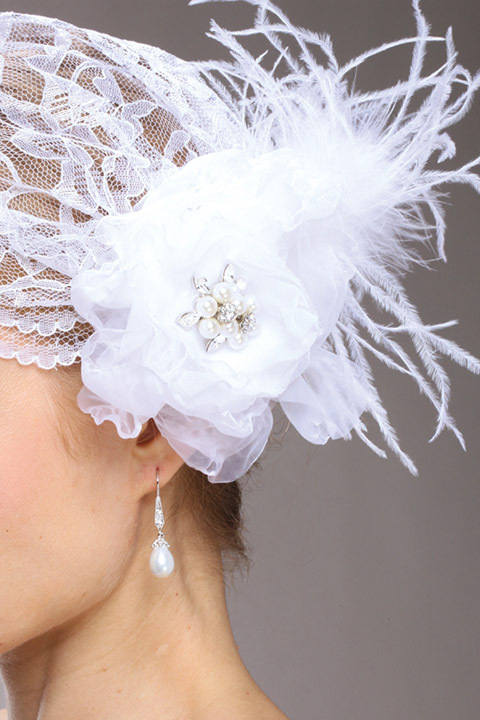 * Our lace cap has a 5" w x 8" h hair clip with an organza flower & ostrich feathers. * Wear our cloche inspired lace cap with vintage organza flowers and feathers for high class vintage styling from the 17th century to the 19th century. * The detachable hair clip has a hand-singed organza flower and ostrich feather sprays. * The lace cap is adjustable thanks to a cleverly concealed elastic band covered with gathered lace. * Our gorgeous white lace cap is completely hand-made in the US. * This designer Juliet cap is featured here in White, it is also available in Dark Ivory as style 3902V-DKI. * For the bride who treasures all things vintage yet avant-garde, this Juliet cap is a must!